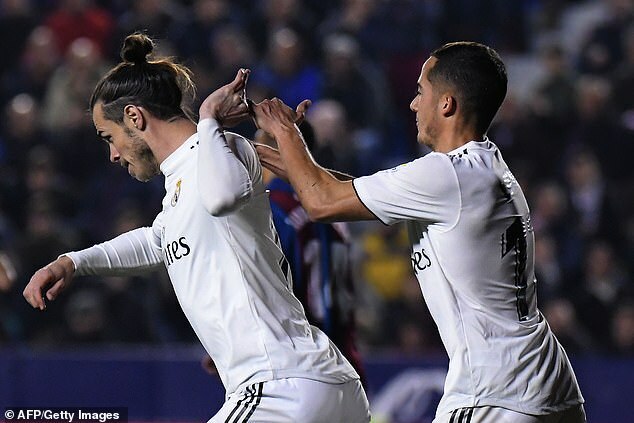 Gareth Bale does not have a problem with Real Madrid winger Lucas Vazquez who he refused to celebrate with after scoring the team’s winning goal on Sunday night. Bale is upset at what he feels is the constant scapegoating of him in Spain and is also not happy at the way several team-mates have fuelled that anti-Bale feeling, with dressing-room revelations in recent interviews they have given. He vented some of that built-up fury after scoring the penalty which won the game for Real Madrid on Sunday against Levante but Sportsmail has learned that there is no problem with Lucas, who he pushed away after scoring the late winner. Lucas was just ‘unlucky’ to be first in the queue to congratulate with him after he scored the decisive second goal in Real Madrid’s 2-1. Bale did later accept the congratulations from other players including Dani Carvajal and Luka Modric after his goal. 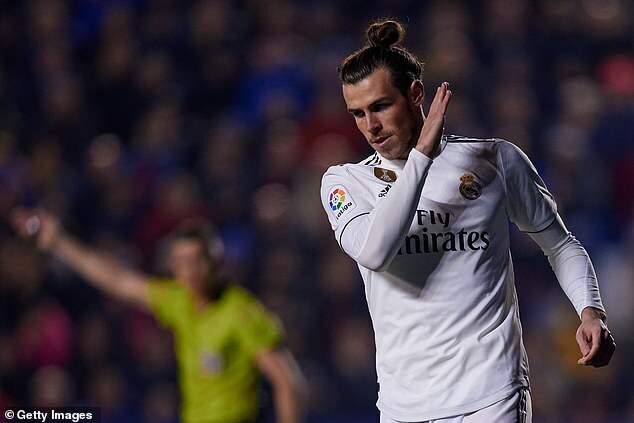 Sportsmail has also learned that although there was widespread condemnation from Madrid media in the aftermath of Bale’s no-celebration, coach Santiago Solari was delighted to see the player’s show of fury and believes it is the secret to him having a storming end to the season. When asked about Bale’s reaction to scoring, Solari described Bale’s mood in the dressing room immediately after the game as ‘pletorico’ meaning ‘full of joy’. The Argentinian coach has publicly backed his player but has also privately supported him and still believes he can have a huge role to play in the climax of Real Madrid’s season. ‘He can celebrate however he wants as long as we win,’ he added. Catalan press reveled in suggestions emanating from Madrid media that Bale had ‘broken with the rest of the Real Madrid dressing room’. They will look to focus on any cracks in the opposition ahead of two massive Clasico meetings this week. 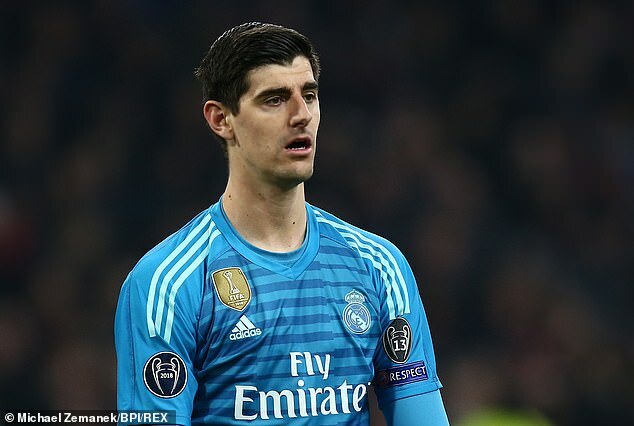 But those claims are wide of the mark although the tale-telling interviews from Marcelo and particularly from Thibaut Courtois who has only recently arrived at the club have not been appreciated. 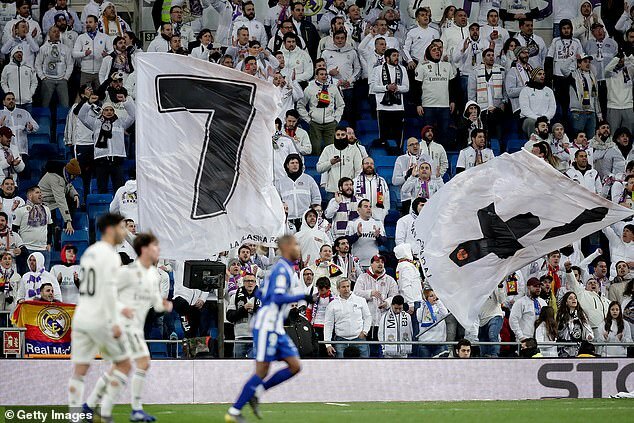 Currently, Bale’s biggest obstacle is to overcome bad feeling from supporters inside the Santiago Bernabeu and that strained relationship will be put to the test on Wednesday in the second leg of the Spanish Cup and on Saturday night in La Liga. ‘I live like somebody who is born and bred in Madrid. I eat late, I go bed late…it is their way of life. Real Madrid take a 1-1 away leg result into the second match making them marginal favourites to progress. At the weekend they can close the gap between them and leaders Barcelona from nine points to six if they win the home league fixture. Bale is not expected to start both games with Vinicius, Karim Benzema and Lucas Vazquez currently Solari’s first-choice front three. Lucas’ place ahead of him in the team led to speculation that when Bale pushed away the Spain winger after scoring the penalty on Sunday it was from bad blood caused by him getting in the XI. But mild-mannered Lucas seems to have been the inadvertent victim of Bale’s frustrations aimed more at negative coverage of his record at the club.